Riding an inflatable towable tube is one of the most exciting and thrilling activities you can engage in when you’re out on the lake on your ‘toon. However, your family or guests’ safety is paramount – and you must make sure that each and every person about to ride behind your boat is equipped with the minimum safety equipment and knowledge. After all, if an accident happens, you, the boat owner, will be the one held responsible for not taking the necessary precautions. That being said, what exactly do you need to do to make sure people are having the time of their life while still being safe in case of an accident? It goes without saying that everyone on your pontoon should wear one the moment they step on the deck. Naturally, if you’re all responsible adults with little to no intention of getting yourselves wet that day, you might skip on wearing one at times, but for people about to get in the water, and especially ride an inflatable towable tube at a rather high speed, lifesaver jackets are mandatory. Make sure they are well-fitting, especially when it comes to kids and people who can’t swim. Also, you might want to equip your boat with a buoy in case someone managed to slip out of their lifesaver jacket. Better safe than sorry. We get it – riding a towable tube at a low speed takes all the fun out it. However, you must still watch your speed, especially if you have first-time riders or young kids on the tube. The recommended speed for young children is 15mph, while teens and adults should be safe up to 20mph. Before you get out on the lake, make sure you’re aware of speed limits, shallow water/ congested water warnings, and other aspects that could give you trouble when towing something. You should also make sure that there are no moving objects anywhere in your way when you’re sailing at a high speed. Might be a good idea to appoint a watcher, aka a person who would stay at the front of the boat and watch for any obstacles in the boat’s way for you. As the steering spot doesn’t usually have the best visibility of what is in front of the boat, a watcher could help you avoid running into a buoy, or worse, a swimmer or a diver. 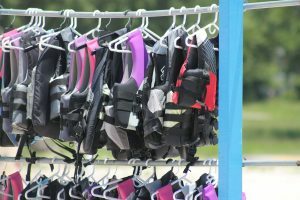 Lifesaver jackets are a must, but you can also invest in other safety equipment for your riders, especially if, again, they are young and rather inexperienced. Sports helmets might be a good idea, as well as sports gloves, especially if the handles on the towable tube are neoprene. Sports gloves will help people grab tighter onto the handles and reduce the risk of blisters afterward. This would be everything you need to take care of before letting your guests go all out on that towable tube behind your ‘toon. After you’ve checked all of the above, you’re ready to hook up the tube to your boat and get the fun started!